Ronaldo fined twenty thousand Euros by Uefa for celebration – Royal Times of Nigeria. 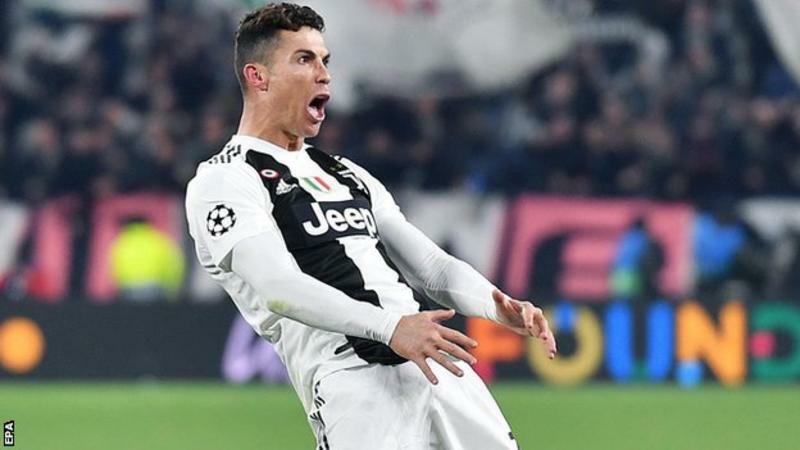 Juventus forward Cristiano Ronaldo has been fined twenty thousand Euros by Uefa for a goal celebration in the win over Atletico Madrid in the last sixteen of the Champions League. The thirty-four-year-old appeared to mimic Atletico boss Diego Simeone, who turned to fans and grabbed his crotch during his side’s two-nil first-leg victory. Ronaldo made the gesture when completing his hat-trick in the return leg as Juventus won three-nil. Simeone was fined seventeen thousand pounds for the act. Juventus have been drawn to play Dutch side Ajax in the quarter-finals.